British scientists have discovered a "lost world" of new species of yeti crab, starfish, barnacles, sea anemones — and potentially an octopus — on the sea floor near Antarctica. Research teams led by the University of Oxford, University of Southampton and British Antarctic Survey reported their findings Tuesday in the journal PLoS Biology. They used a Remotely Operated Vehicle (ROV) to explore the East Scotia Ridge deep beneath the Southern Ocean where hydrothermal vents (including "black smokers" reaching temperatures of up to 382 C) create a unique environment that lacks sunlight but is rich in certain chemicals. 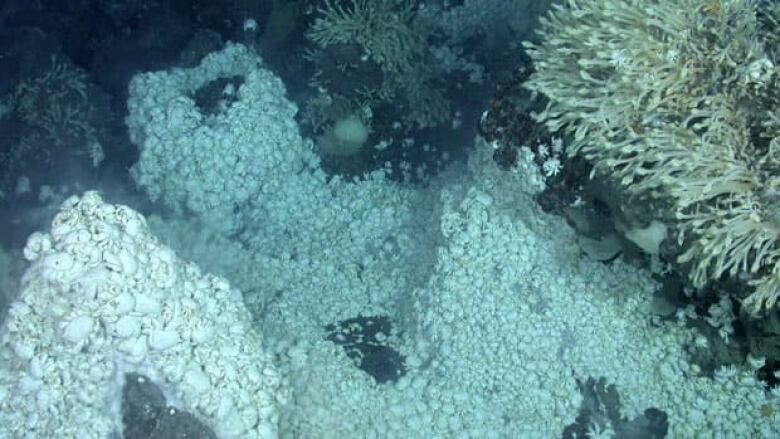 "Hydrothermal vents are home to animals found nowhere else on the planet that get their energy not from the sun but from breaking down chemicals such as hydrogen sulphide," said lead researcher Alex Rogers, a professor in zoology at Oxford University in England. "The first survey of these particular vents … has revealed a hot, dark, lost world in which whole communities of previously unknown marine organisms thrive." Images from the ROV dives include large colonies of a new species of yeti crab clustered around vent chimneys. The crab is thought to dominate the Antarctic vent ecosystem. Hairy new crab nicknamed after David Hasselhoff. Numbers of an undescribed predatory sea-star with seven arms was seen crawling across fields of stalked barnacles. An unidentified pale octopus was also found, nearly 2,400 metres down on the sea floor. What the ROV didn’t find was almost as surprising as what it did. Many animals, such as tubeworms, vent mussels, vent crabs and vent shrimps, found in hydrothermal vents in the Pacific, Atlantic and Indian Oceans, weren’t there. Scientists believe the Southern Ocean may act as a barrier to some vent animals. The unique species of the East Scotia Ridge also suggest that globally, vent ecosystems may be much more diverse and their interactions more complex than previously thought.